Vehicle registration numbers and plates, in whatever shape and form, have a common objective in whichever part of the world you may be in. It is an inventory and security means to identify and control the existence of vehicles in any country. Usually made of plastic or metal, the number plate is required by law to be attached to a vehicle in an acceptable visible and unambiguous manner to aid relevant authorities during inspection and identification. The registration number or identifier is an alphanumeric code that identifies a vehicle within the entire country or within a state or province. This identifier, wherever it may be, is unique. In some countries like Malaysia, transfer of vehicle ownership is permissible whereby the vehicle registration number can be transferred from one vehicle to another as long as the source vehicle takes on a new unique number. While most countries tag the vehicle registration to the vehicle, there are some that attach it to the person. In most of the countries around the world, local ordinance or laws require that the registration plate be attached to both the front and back of the vehicle. The unique registration number of a vehicle is stored in national databases whereby this number or vehicle identifier is the primary key that links to other salient information describing the vehicle. In countries which are computerized, each registration number will contain essential details such as year of manufacture, engine capacity and number, chassis number in addition to name of the make and colour. Also stored in the databases will be the name and contact information of the current and all previous owners of the vehicle. 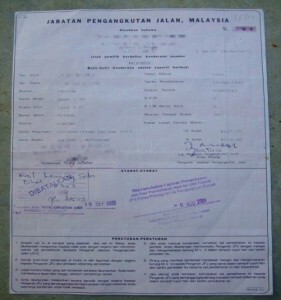 Vehicle Registration Certificate In Malaysia, for example, each vehicle has a hardcopy record of the vehicle details stated above, along with other details like name and address of current vehicle owner, either private individual or commercial entity, records of yearly licensing fees paid (called road tax) and records of all transfers of ownership. This vehicle registration certificate or “grant” is expected to be in the possession of the current owner at all times. Any illegal modification to the vehicle, for example the replacement of the engine, can be detected at some time when an inspection is made and it is found that the engine number engraved on the engine and that recorded in the registration card, are not the same. Most countries impose detail design and measurement specifications to vehicle registration number plates. This is to facilitate better security and visibility at checkpoints and general surveillance activities. One aspect of the design considerations is the font used and size of the alphanumeric number or identifier and the overall plate size. Colour of the plate also varies among countries. 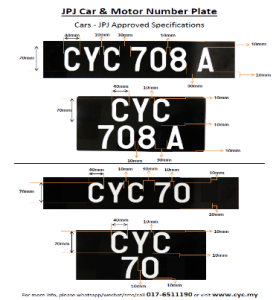 In Malaysia, the shape, size and material used for number plates may vary and would be deemed to be legal provided that they adhere to existing number plate guidelines. While the preferred typeface or font most popularly selected is the Arial Bold, other readable fonts may be used depending on the vehicle dealer’s or owner’s preference. The early number plates used were largely made of pressed metal, but since the 1970s, plastic plates and characters made their way into the scene. It is not uncommon for Malaysian vehicle owners to bid for VIP and Golden registration numbers and have them presented very nicely and prominent with expertise. Some have even transformed ordinary numbers on the plate to look meaningful. For example, the registration number “QA 2120 L “would be nicely done up on the plate to look like “Q A2I2OL “, where the ‘2’ would be made to look like a ‘Z’. The name of the driver or owner of that vehicle would probably have been Azizol! On Nov 1st 2014, the Malaysian Road Transport Department (RTD) embarked on a nationwide crackdown on vehicle registration number plates that do not conform to set guidelines. However, this operation was called off days later when vehicle owners complained that the number plates were affixed by the vehicle dealers and that they had assumed it was in compliance with the law. In addition, there was inconsistency in the interpretation of the guidelines among other state RTDs as well. One state RTD was of the view that if the registration number could be seen clearly from 21 meters, it was acceptable, whatever the font or size used.